Can Indian Herbs Help Me to Lose Stubborn Fat & Cellulite? Herbs have been used for hundreds of years to help improve liver health and function. The National Digestive Disease Information Clearinghouse states that cirrhosis is a liver-related condition involving degeneration and dysfunction of your liver tissue. If you have liver cirrhosis, your healthy liver tissue is being replaced by scar tissue, which impairs blood flow through your liver. If you are considering using herbs to help treat your liver cirrhosis, first consult with your physician about the potential benefits and drawbacks of herbal therapy. The University of Maryland Medical Center states that cirrhosis is commonly caused by alcohol abuse. In fact, in the U.S., excessive alcohol consumption is the leading cause of liver scarring. Other possible causes of cirrhosis include hepatitis B and C, cystic fibrosis, certain autoimmune conditions, blocked bile ducts and iron- and copper-related metabolic disorders. Signs and symptoms of liver cirrhosis include jaundice, fatigue, decreased appetite, swelling, vomiting, nausea, weight loss and abdominal pain. Some herbs may possess the ability to protect and restore the health and function of your liver. Dr. William Mitchell, an herbal medicine expert, naturopathic doctor and author of "Plant Medicine in Practice," states that the following herbs may be beneficial for your liver: dandelion, bearsfoot, New Jersey tea, Indian arrowwood, St. Mary's thistle, Harts-tongue fern, common woodsorrel, gentian, toadflax, and agrimony. Celandine, milk thistle and bupleurum are other useful herbs for liver problems. Milk thistle is one of the most popular herbs for the treatment of liver cirrhosis. 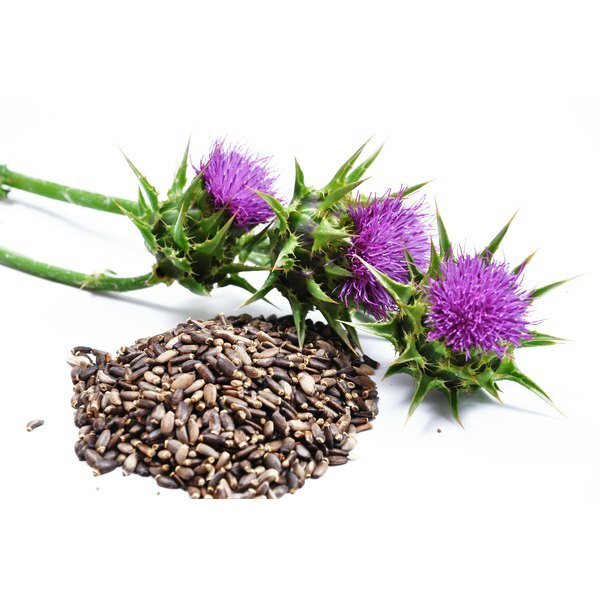 Milk thistle is a plant indigenous to the Mediterranean region but now grows around the world. The leaves of the milk thistle plant produce a milky fluid when crushed. Silymarin is the active ingredient in milk thistle that helps protect your liver and treat liver conditions such as cirrhosis, hepatitis and fatty liver. Silymarin, a combination of flavonoids, helps liver cells damaged by alcohol and other toxins regenerate. Certain herbs may help treat your liver cirrhosis, although there is no guarantee of a cure. You should understand the risks associated with herbal remedies before using them to treat your liver dysfunction. A health care professional with advanced training in botanical medicine can tell you what herbs are safe for you, how to use these herbs most effectively and what side effects you might experience. Herbal remedies contain active ingredients that can cause significant physiological effects. Always talk with your doctor before taking herbs. Robyn Hughes has been writing since 2008 about health, nutrition, fitness and botanical medicine. She is a naturopathic physician and freelance writer based in Durham, N.C. She holds a Bachelor of Arts in cognitive science from Indiana University and a doctoral degree from the National College of Natural Medicine in Portland, Ore.
Can You Take Alpha Lipoic Acid & Milk Thistle at the Same Time?